Shivraj Singh Chauhan, the Chief Minister of Madhya Pradesh, has clearly indicated who he considers his leader as and it is none other than senior BJP leader LK Advani who seem to have been side-lined in the BJP by the powerful NaMo mantra a.k.a. Gujarat CM, Narendra Modi. 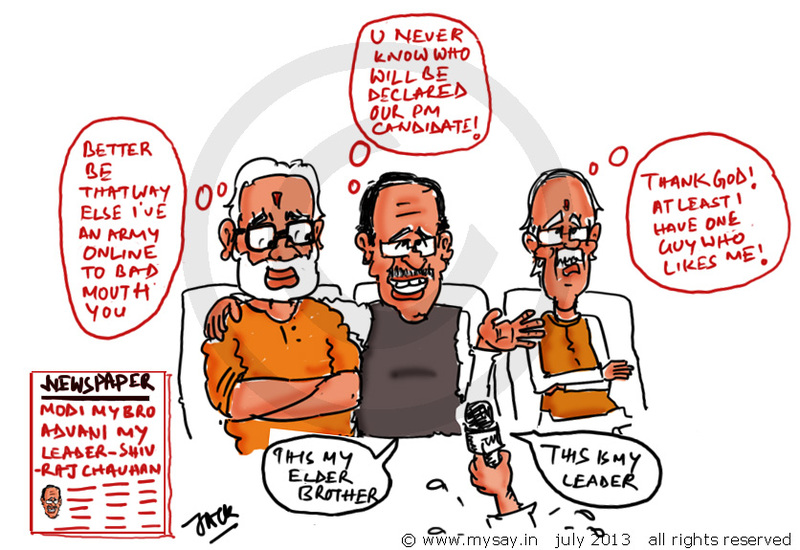 Although,for Modi,Chauhan stated was like his elder brother ( I think,to keep things clean and play safe). Useless Creatures these leaders are..
Haha !! Modi’s online army… All those wannabe wannabe political geniuses on Facebook !! ha ha ha! The new mantra is NaMo! 🙂 🙂 Height of insecurities when 65 MPs felt obliged to write a letter to Obama requesting him not to grant a US visa to Modi. Its like childs play that’s going on! Don’t you think? “Whenever we cant do anything, lets go to the headmaster” mentality! Funny thing is Obama isn’t even the headmaster!!! I’m already sick of Modi!!! !